Stocks a large range of papers, maps, cards, portfolios, stamps and posters, all with a feeling of nostalgia and illustrations from the bygone era of travel. Just beautiful! This is a very popular store right in the heart of Melbourne. Spread over two floors, there are lots of greeting card designs, gifts and of course magazines. You can watch the hustle and bustle of city life from the top floor windows overlooking Elizabeth Street. My go-to destination for paper! It also stocks all the latest stationery designers and anything you could possibly want from the world of stamps, stickers, cards and envelopes. This delightful bookshop is always very busy on the weekend. They have a great range of books on all sorts of topics, spread across two floors. Located very close from the beautiful Albert Lake, this is my favourite bookshop in the city. If you’re after beautiful gifts and homewares, then look no further. While the stationery selection is a lot smaller, this shop is simply a joy to visit every time. This Swedish brand owned by Kristina Karlsson needs no introduction. Filled with everything one could possibly want from the world of stationery, it’s no wonder how successful they have become, even opening international stores. This is a beautiful gift shop in the heart of Camberwell. 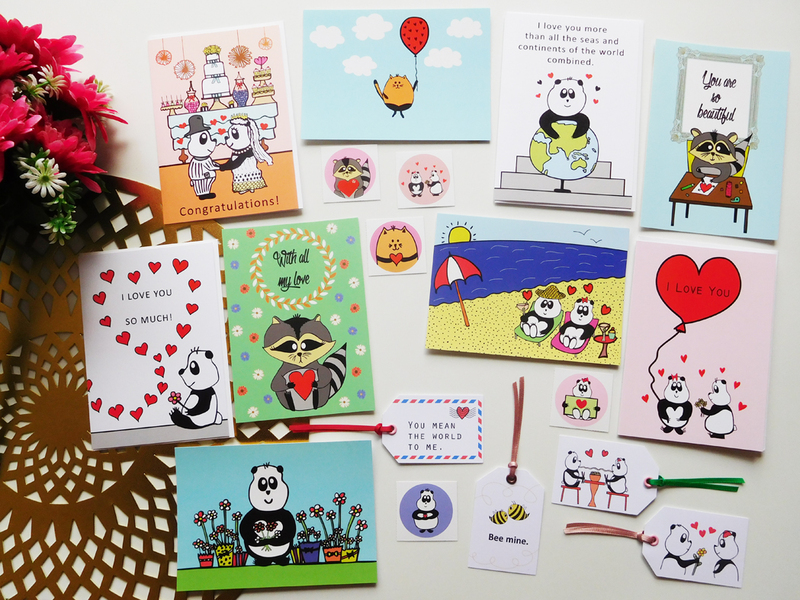 Here you can find a lovely selection of cards, posters and children’s gifts. Maling Road should be on any gift-lovers list when visiting Melbourne. While this shop is tiny it stocks some well-known international brands such as Rifle Paper Co. This Japanese chain is full of lovely stationery including envelopes, stickers, notebooks, letter-writing sets and everything for your household. Most things cost only $2.80. They cater for the wedding market by supplying beautiful wedding invitations and stationery printed right in the store. Not only that, there’s a great range of top-notch washi tapes, stickers, papers, envelopes, paper clips and more! Highly recommended. This brand owned by Cotton On has just exploded in Australia recently and has also gone international. They sell all sorts of funky cards and gifts, mostly catering to the young and young-at-heart demographic. There’s always something new happening at Typo. This is not their only store but this one is my favourite. There’s everything you could possibly want to buy from the world of stationery and gift wares plus the shop is always decorated beautifully. With another store in the beautiful Mornington Peninsula, Page 8 has always been a favourite of mine. They sell gorgeous coffee table books as well as jewellery and cards from well-known brands. This small but cosy gift shop is just beautiful and packed with excellent selections of gifts and cards. There’s a lovely range of Australian souvenirs as well as clothing to buy. What feels like Chadstone Shopping Centre’s tiniest shop, here you can buy cards for any occasion as well as invitations, stickers, gifts and more. This shop is just lovely! They stock a great range of papers, ribbons, embellishments, cards, stickers and more. The owners are very friendly. Definitely worth a visit if you’re planning a wedding as well. Recently this brand has had a makeover and now they sell stunning gifts as well as soaps, homewares, paints, papers and everything for scrapbooking. Everything is quite affordable and Australian owned. Entering beautifully decorated stationery shops always gives me such a thrill! I should also point out that there are some great gift shops in greater Victoria. Take a trip to the Dandenong Ranges to towns such as Olinda and Sassafras or drive down the coast to beautiful Rye and Sorrento for some great local shops. They are slightly overpriced due to the seasonally higher numbers of tourists who visit these towns but they shouldn’t be overlooked. There are so many things to love about Japan. Today I’d like to introduce you to ZenPop, a Japanese company that sends the coolest products from the heart of Osaka to anywhere in the world. While it sounds like a subscription-style service, it isn’t. You can purchase individual packs each month without knowing exactly what’s included (because it’s a surprise!) but ZenPop do showcase a few products on social media and hint about the contents on their website. I bought the Japanese Stationery Pack for the month of April with a “Kawaii” or cute theme, which promised 12 or more items. The box in which the products arrived was so cute and featured the ZenPop bunny mascot jumping for joy! Inside the box the first thing seen was a little note which said “You got a lucky box with a pair of lucky socks” and of course a smile instantly came to my face. The items included were all so cute and useful too. I’ll certainly be using the pages of the Sanrio notepad to write letters to penpals and the sushi stickers to decorate the envelopes! All the pens were great and wrote ever-so-beautifully on paper. The washi tape was certainly a highlight as was the gorgeous Rilakkuma folder. Can’t wait to also use the MONO correction tape on one side and eraser on the other! Overall, I loved the ZenPop Stationery Pack. All the products were of very high quality and with a large variety of inclusions from stickers to sticky notes, paper, washi tape and pens. No two boxes are the same as there are endless colour and design combinations ZenPop sends you. It took just under 4 weeks to arrive to Australia from Japan but it was so worth the wait. For all the info on ZenPop’s other packs please visit their website here and try something new from Japan for yourself. Disclaimer: All opinions expressed in this review are 100% honest. This box was purchased by me and I genuinely loved all the products and wanted to publish a review here. Where has this year gone? We’re almost at the end of 2016 and yet it doesn’t seem real somehow. Soon we’ll be decorating the Christmas tree again, singing carols by candlelight and making new year’s resolutions. It’s really hard to comprehend how quickly this year has passed by. Who else agrees? This month we’ll ship our fourth Mishka Mail parcel with a quirky Christmas theme. There will be plenty of cute greeting cards, gift tags and stickers to get you into the festive spirit, as well as a few surprises! Subscriptions are open until next Sunday, 20th of November and you can buy one here. Our October Mishka Mail kit was themed “Slow down, Take it easy”. We included various stationery items celebrating all the ways we can lead a simple, healthy lifestyle. This year we published our first advertisement in a cool Canadian magazine called Uppercase. We appear in their special 30th issue. Our studio had a little makeover with new artwork on the walls and a few changes to things here and there. We love how it’s turned out! Lastly, we’ll be exhibiting at a fantastic new pop-up market at the Caribbean Gardens (1280 Ferntree Gully Road, Scoresby) this Sunday, 20th of November. Make sure you come along if you’re in Melbourne as there will be tonnes of fun attractions and awesome craft stalls from 8.30am – 4.30pm. More info can be found here. We are so excited to present to you our Mishka as a 3D model! What started out as a drawing on a piece of paper then became our greeting card and gift tag products, and now we have our very own business card holding Mishka model, perfect for trade shows, events and markets! We simply can’t wait to showcase him somewhere in Melbourne soon! 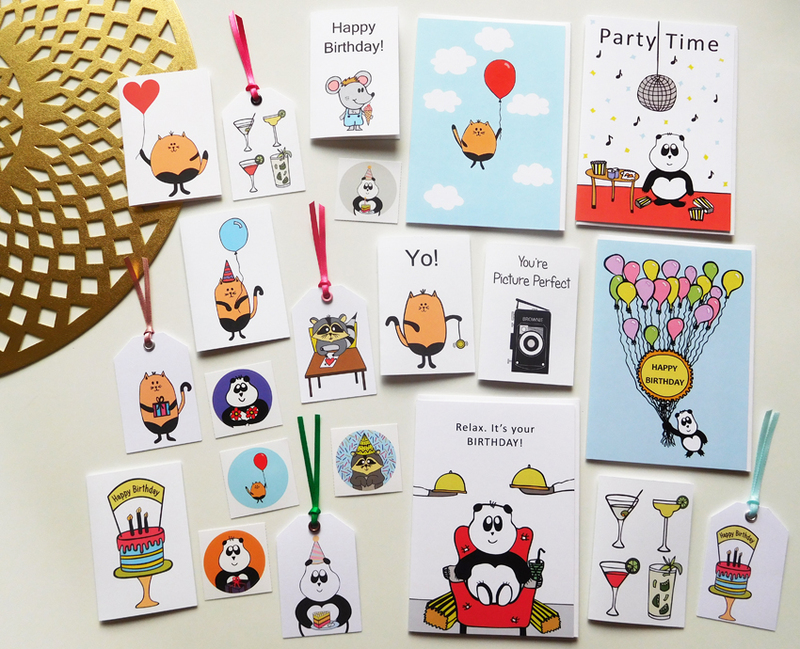 You can purchase greeting cards with our Mishka on them from our Online Etsy Shop here. Last month I participated in my first Snail Mail Collective. Organised by the lovely Lauren from Lost in Travels and Melyssa from The Nectar Collective, this monthly gift exchange is where you are partnered with someone most often from a different country, and you send each other gifts to a maximum value of $5. I absolutely love sending and receiving packages (who doesn’t?) so I signed up without hesitation. As this was my first gift swap I was super excited to get to know my partner. The lovely Beka (check out her beautiful blog: Sunshine to the Square Inch) from America was my partner and the theme for the exchange was Gratitude. 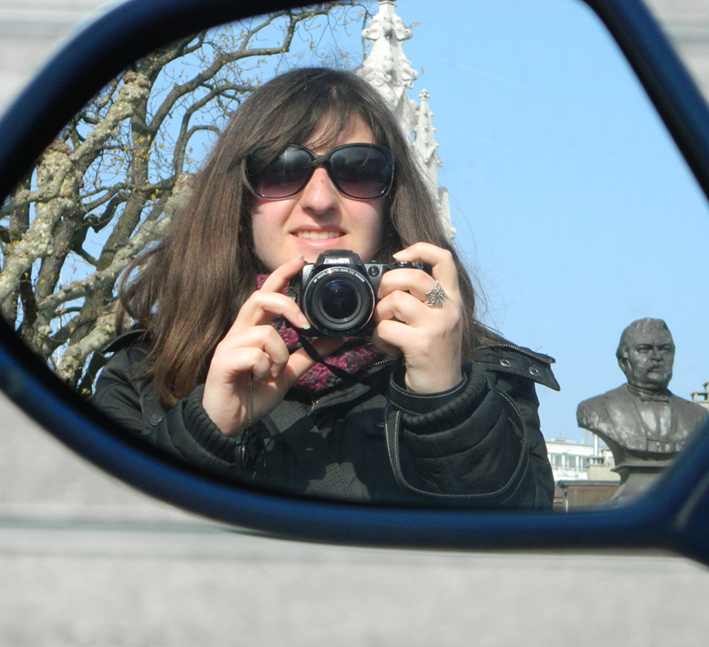 You can see what I sent Beka here and today (finally!) after almost a month in transit, I received her wonderful parcel. Patience is the key to great snail mail surprises! Beka sent me her favourite hot cocoa mix, which I can’t wait to taste! She also sent an incredibly thoughtful journal with some handwritten quotes inside. In the card she suggested that I “write in the journal things [I am] thankful for. It helps keep a good perspective and is good to read through when [I] have a bad day.” That’s such an amazing idea Beka, thank you so much for your kindness, wisdom and thoughtfulness in sharing your favourite quotes with me. I’ll be sure to take you up on your suggestion and fill the pages with meaningful blessings. I’m so grateful to have come across you! Thank you for your parcel, it made it here on Christmas Eve! What an amazing surprise! If you’d like to sign-up for the January exchange, you can keep an eye out for the order form on the organiser’s websites. As long as you join by the 7th of the month usually, you’re good to go! Happy Snail Mail everyone!